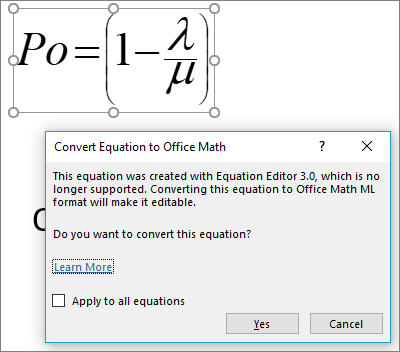 Microsoft Equation Editor 3.0 (MEE) was a third-party component that was included in many versions of Office to help users add math equations to documents. MEE was pulled from the product, retroactively back to Office 2007, due to security concerns. The modern, built-in, Office equation editor uses Office Math Markup Language (OMML) as the preferred format for equations in Office files. You should convert any existing MEE equations to the OMML format if you want to edit them. How do I convert an equation? All you need to do to initiate a conversion is to double-click on your equation, or select the equation and press Enter. When you do that you should get a prompt that offers to convert this equation (and all other equations in this file) to the OMML format. Note: You only need to do this on equations that were created in Microsoft Equation Editor. Will my equation convert successfully? In most cases the equation should convert just fine. You may see some formatting differences, like a slightly different font or spacing, and if you've used colors in your equation you may have to reapply the colors after conversion. One exception is that the equation converter does not support long division. If your equation contains long division you'll probably want to recreate it rather than converting it from the old format. The equation may already be in a supported format, such as OMML, and not require conversion. The equation converter is only available for Office 2019 and Office 365 build 16.0.10730 or later. Tip: Not sure what build of Office 365 you have? See About Office: What version of Office am I using? Your file may be in an older format, such as .DOC, .PPT, or .XLS. Save your file in the modern, Office Open XML, format by clicking File > Save As (or Save a Copy if it's stored in OneDrive or SharePoint) and save a new copy of the file in the Office Open XML format (.DOCX, .PPTX, or .XLSX). If this file is shared, and other users are currently editing it, double-clicking the equation will open a dialog box that lets you know that conversion can't be done while multiple users are editing the file. Once the other users have exited the file you should be able to convert any equations. Upgrade to Office 365 or Office 2019, then you can use the equation converter. Download and install MathType from Wiris. MathType has a free 30-day trial, after which you can purchase it if you still need it. If you like this feature, and especially if you don't, we want to hear about it. Go to File > Feedback in your Office app and choose the appropriate option. If you use #MEEConverter in your feedback that will make it easier for us to find. Also, if you want to show us what your equation looks like please select the box to include a screenshot.